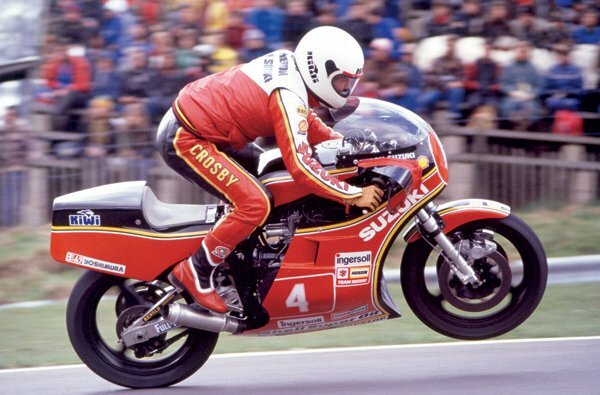 Crosby, who was briefly team-mates with Dunlop in 1980, will ride his original XR69 Suzuki on which he was highly successful, the machine now being part of the Team Classic Suzuki stable. The Kiwi took the machine to victory in the 1980 and 1981 World Formula One Championships as well as countless race wins and championships on the UK's short circuits. His TT career spanned just three years but in that time he was nothing short of sensational, finishing a stunning fourth on his debut in the 1979 Formula One race and then taking race wins in the 1980 Senior, 1981 Formula One and 1981 Classic TT Races, the last two coming on the aforementioned XR69 Suzuki. Crosby clinched his first World F1 title at the Ulster Grand Prix in 1980, when Dunlop joined him as team-mate, the Ballymoney man easing off in the closing stages of the race to allow Graeme to take the win and the world title. Dunlop, of course, joined Honda for the following season with the duo going on to have numerous battles during the course of the season, none more so than in the 1981 Classic TT. There was little to choose between the two riders in the early stages and although Dunlop claimed the outright lap record before retiring, with a speed of 115.40mph, Crosby was only 0.8s slower at 115.32mph and went on take the win from team-mate Mick Grant. Although his TT career was brief, Crosby was arguably one of the best ever racers to grace the Mountain Course and had he continued on the roads, he would almost certainly have racked up more wins and podiums. Graeme will also be attending the Classic TT VIP Hospitality events and RST Heroes Dinner. You can join Graeme at these events and tickets can be purchased from http://www.iomtt.com or by phoning 00 44 (0)1624 640000.